Prior to every weekend is this bout of hectic activity - searching and finding another place to visit over the two days. Though weekend trips are a regular affair in my life now, laziness does not permit to research and keep an inventory of such places handy. It all has to start around Wednesday, when even the calendar finally says WTF. And invariably there will be some catalyst for this increased activity, like a call from a friend who has nothing better to do than suffering my company. 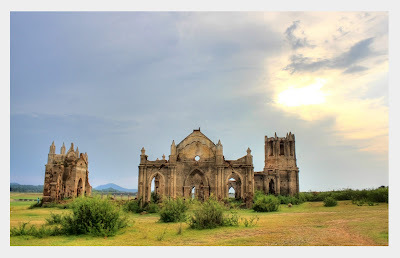 It wasn't any different with this trip to the Gothic church at Shettihalli. Sunil cancelled his weekend trip home and called in to say that he is available to go 'anywhere'. About Sunil, he is never worried about the place, as long we are traveling and not rusting our asses in the city. He is a rare breed who rates the journey a few notches above the destination. It was a few months back that I accidentally came across a picture of this Gothic beauty on Flicker, and this trip had indeed been finalized that very moment. There was something attractive about the picture of a dilapidated church, half submerged in a water body. I could not find much information about the place in my subsequent research, but whatever little I got was fascinating enough to look forward to the trip. 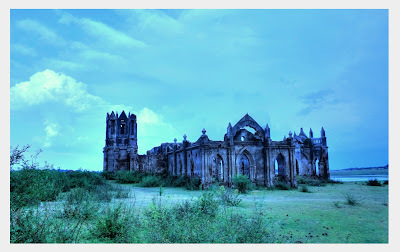 I wanted to time the trip properly to see the church in all its splendor, as 70% of it goes under water after the rains. After seeing the picture Sunil also agreed to go find this place, and we started as usual on that Saturday morning. We did not have a clear idea of the route, except that we have to take a detour near Hassan from the Bangalore-Hassan road to reach the village of Shettihalli. And then somewhere close to Channarayapattana we saw a signboard saying 'Shettihalli 3 kilometers', with an arrow mark pointing left. The actual deviation to THE Shettihalli village is at some 2 kilometers on the Haasan bye-pass road, the third left turn after Rajeev Institute of Technology to be precise. A shopkeeper assured us that we are on the right track and the church is another 12 kilometers from the bye-pass road. Though the instructions were clear we started getting doubts after some 10 odd kilometers. Fortunately we met another gentleman on the road who knew the exact spot and even some history of the place. 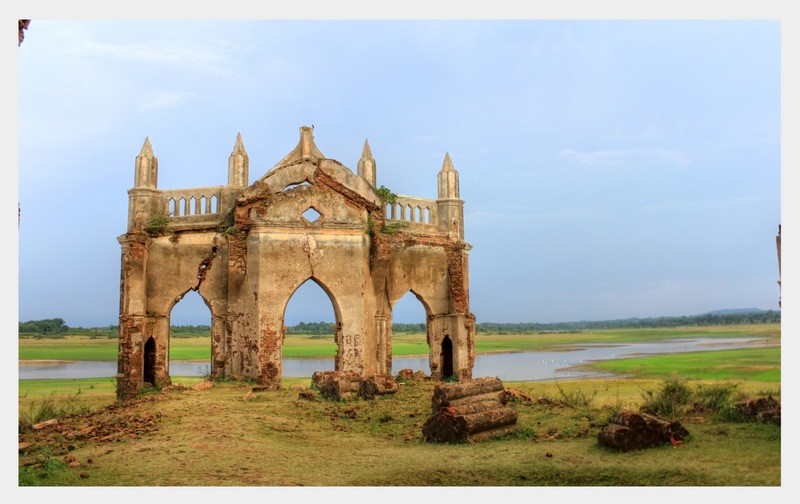 And as we traveled another kilometer or so we saw glimpses of the church off the road; the water level had receded much beyond the church and the dam looked more like a pond in somebody's backyard. 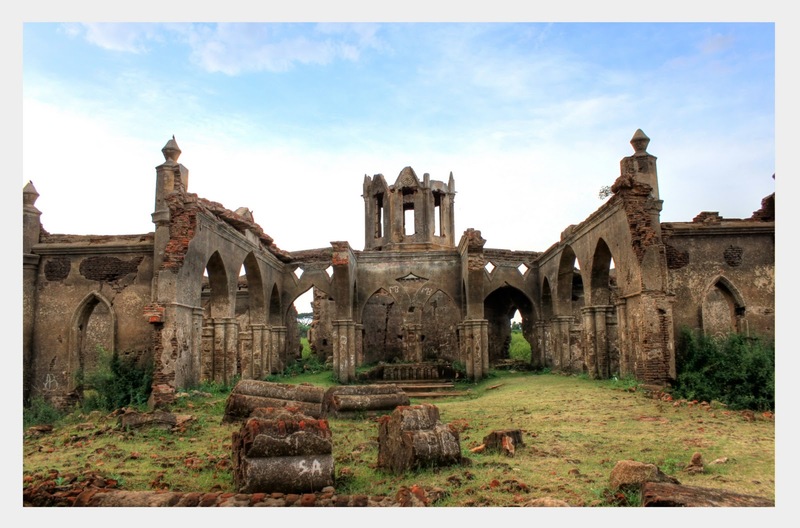 The Holy Rosary Church at Shettihalli was built by French missionaries in 1860 for British estate owners around Sakleshpur. The church was reportedly built with mortar and bricks and a mixture of jaggery and eggs - the secret sauce that helped it withstand the elements for almost 150 years. 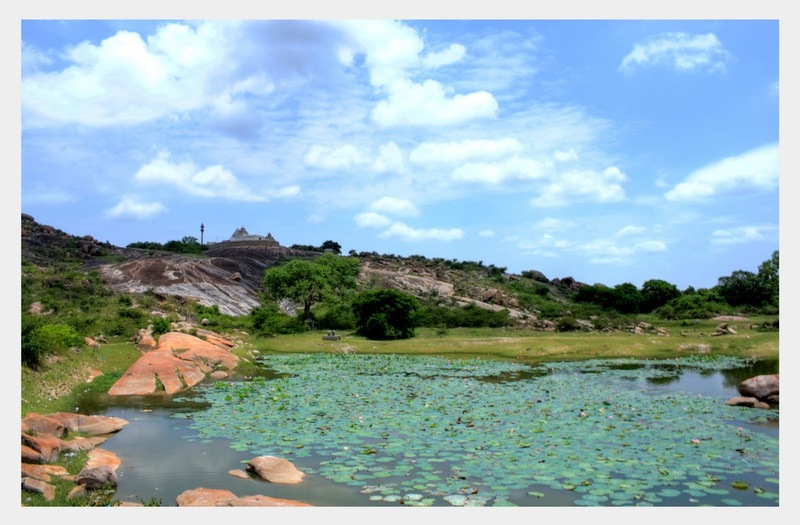 It was submerged during the construction of the Reservoir across Hemavathy river at Gorur, to irrigate lands in Hassan, Tumkur and Mandya districts. It stays submerged in water half the year and lives above it during the other half! It is difficult to believe that there was once a thriving population around the church. When the reservoir was built, the villagers were rehabilitated to Channarayapatna and Arkalgud and the whole place has a deserted look now. The church is an absolute architectural beauty even in its old age. 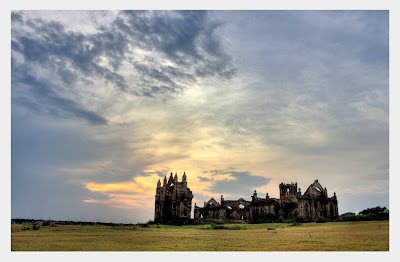 Built in typical Gothic style, it has got pointed arches and ribbed vaults. The height of the structure, judging by what remains, is considerably more than its width - another standard feature of the Gothic style. It is built in the Latin cross plan, with a long nave making the body of the church towards the western facade, and two transverse arms (Transepts) to its either side. The nave and the transepts are adorned with long pointed arches in cluster of three. There is a partly destroyed tower behind the alter, which probably had a huge bell hanging on the top. I can only imagine the majesty of this structure in its hey days, with possibly stained glass covering those big arches and windows! The atmosphere was so mesmerizing, especially with the setting sun adding its own beauty to the mix. We brought the laptop from the car and played Mozart's Symphony No.40 and sat there listening till the sun went down well beyond the horizon. Apart from some Painted Storks, Greater Egrets and an occasional Brahmini Kite, the place was thankfully deserted. I think the music brought life back to the stone walls that I could almost hear them communicating with us, telling stories of a glorious past abruptly cut short. The structure had an impact on the music as well I think, never have I enjoyed the piece like I did that day. Before we knew it was dark, and frogs were out in plenty adding vocals to the symphony. It was time to get back to Haassan and find a place to crash.. had an overdose of beauty for one day. Your blog is a treasure trove. Waiting eagerly for more..
Beautiful pictures with wonderful narration! this is an amazing find !!!!! ur like the modern Indiana Jones lol . 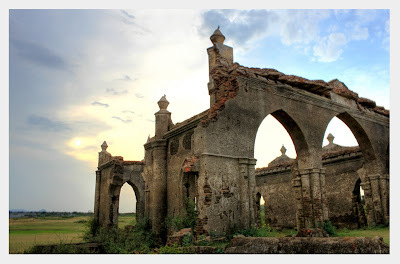 I have a passion for old ruined buildings . @John: Glad to know you liked it!